Never miss a deal again! Sign up for our brand new Facebook community! Waking up with your alarm clock and having a cheerful attitude in the morning are both important things, but they are not enough to make your morning productive. Without charting a course of action for the day, you’ll likely waste time, wander aimlessly, and run around in circles. You may even get to the end of the day and wonder what on earth you did with your day. A plan gives you purpose, motivation, and direction. When you know where you want to go, it’s much easier to make traction in the right direction. When you know exactly what you’re aiming to accomplish in a day, it’s much easier to actually get things done. A plan also helps you track your progress and be encouraged that you’re getting somewhere! Small steps in the right direction can result in big change over time. When I make a plan for my day, I think about not only the things that must be done (laundry, dishes, homeschooling, appointments, phone calls, etc. ), but I also think about the big picture. What small steps can I take today to help me move toward where I want to be in a year from now? Change your life by setting big goals and breaking them down into bite-sized pieces. In order to take small steps toward where you want to be in a year from now, you need to actually have a good idea of where you want to be in a year from now. This is why I recommend setting yearly goals and then breaking those goals down into monthly and weekly goals. When you look at your yearly goals as a whole, they can seem daunting and overwhelming. When you break them down into monthly and then weekly goals, they are much more doable. Transform your to-do list from the mundane to the meaningful through goal-setting. If you take it one step farther and break those weekly goals down into tiny daily goals, your huge goals have become completely manageable. Plus, knowing that you’re doing a little bit each day to inch you closer to where you hope to be in a year from now gives you a lot more purpose and enthusiasm for tackling your to-do list. No longer is your to-do list just a list of things that must be done in order to survive; it’s an action plan of tiny babysteps that are going to give you traction toward greater success in your life as a whole. Sure, there are still going to be a lot of things that aren’t too glamorous — like taking out the trash, washing the car, and giving the dog a bath — but I bet you’ll do those menial tasks with more purpose when you know that each day you’re making microscopic progress in the right direction with your big goals. Bedtime: Made it to bed by 9:45 p.m. just barely since Jesse and I went on a date and got back later than usual. It wasn’t my goal time of 9:30, but at least it was only 15 minutes late! 1. Did you determine your bedtime and 5 Evening Must-Do’s? If so, leave a comment telling us how you did on them last night. 2. Did you determine what time you’re going to commit to waking up every morning for the next three weeks? If so, leave a comment telling us how you did this morning! 3. If you haven’t done so already, pick 1-5 goals that you’d like to accomplish in the next year. Take some time this weekend to break those goals down into monthly and weekly goals. Then, come back on Monday where we’ll be talking more about making a daily to-do list, how to incorporate your bite-sized goals into it, and how to not overload your to-do list. I’ll also be sharing some helpful tips, printables, and resources to help you create and follow through with your daily to-do list. Looking for more? Read more posts about Make the Most of Your Mornings. Subscribe for free email updates from December212012® and get my Guide to Freezer Cooking for free! Can you give some examples of yearly goals, please? I would greatly appreciate it. Thanks in advance! Thank you, I just reviewed your goals. Wow! You have so many. I think I will start with quite a bit less, but I definitely liked many of your ideas and how you broke them down by category. I can’t wait to get my goals mapped out, it seems like fun! Even though this challenge is totally for me, I have been terrible at keeping up with my 5 to-dos and waking up at a preset time. (This is not an excuse, but my husband is facing some major surgery tomorrow, so we’re taking it day to day…wait…that sounds like an excuse 🙂 ) This morning I woke up at 7:50, but that’s better than 8! I’m hoping that, while my husband is in the hospital, I can get some of my to-dos done each night and get to bed at a decent hour. I’m looking forward to the goal-making posts in the coming days! Remember to give yourself grace! It sounds like you have a lot on your plate right now. Small progress is still progress — so celebrate it, even if you’re not doing as well as you would have liked! Megan, I will pray for your husband tomorrow, especially that his surgery will be a success. God Bless. Megan, I prayed for your husbands surgery and for strength for you. Thanks so much! The surgeon was very pleased with the surgery, so now he’s on the road to recovery. Thursday’s, Friday’s and Saturday nights I work over night…so obviously I wasn’t able to get to bed and wake up at the normal time but I did complete my 5 to do’s last night before leaving for work and Wow did it make a world of difference in the morning! Normally I get home and have 20 minutes before the baby sitter gets here and I rush around exhausted trying to get everything ready (and clean up the messes from last yesterday…) Today I was able to sit down and talk with my husband before he left and then I went to sleep not worried about anything that I should have done because it had all been done the night before! Looking forward to Monday’s post! Woohoo! I’m so proud of you — great job! You inspire me! I’m doing pretty well so far. I had decided I needed to wake up for my family not to my family and I’ve been excited for this challenge. But I’ve noticed such a difference this week because I’ve been doing my bedtime routine and getting up before my son to spend time reading my Bible and praying and planning for the day. My husband even commented on how nice the house has looked and he never even notices!! I told him it’s because I’ve been waking up earlier in the mornings!! Woot! I love it! I’m so excited that you’re seeing progress and that your family is noticing a difference! I still don’t see how you’re able to do all that you do. I find it quite admirable. I suppose that I may be overthinking everything, and that there’s actually hope for me. . LOL! I commend you for doing all that you do. I’ve done pretty well getting to bed on time (or only a few minutes late…) But I’ve really seen the difference in my morning if I’m up ready to face the day before my kiddos. We’ve tweaked big brother’s morning job to giving baby a sippy cup of milk and playing quietly in his room until 7:15…that gives me some extra time in the morning (my kids are early risers!). This morning I was excited to have my quiet time in the backyard instead of in my room. Fresh air and sunshine really helped wake me up! This is an excellent post, Crystal. I’m good with the details and creating daily to-do lists, but not so good with looking at the bigger picture. This is just the challenge I need to take goal setting to the next level. Thank you! I had my 3rd baby April 20th, (2.5 ear old and a 4 year old) my husband moved to Houston 10 days later and the kids and I just moved with him 2 weeks ago. I am wanting to get back into a routine, but it is so hard with my baby (even though she is a super easy baby). She is not on any type of schedule so it is hard to plan for the day when I don’t know what she will do. Any suggestions? Maybe you could have a loosely based schedule that’s more based on the time the activities take rather than the time of day? When my son was born, I found that at least having my routines helped a lot to keep my sanity. If you need help with that, she’s already got it covered. Well I’ve done pretty well with the bedtime. This morning I did stay in bed a little longer than planned but was cuddling with my three year old. It was so peaceful and relaxing until I felt a warm wetness against me. It got me out of bed quickly so we could change and I could get the sheets in the wash. That will teach me to stay in bed. Went to bed a hour before my designated bed time last night, but then hit the snooze twice (oooooppppps!). But I am proud to say that did all my nightly choirs yesterday and 3 out of 5 of my nightly choirs done today. My morning schedule is set up and pretty set. I have been doing it for a week – and so far – It has been working wonders. I even think it will work once school is in session – so I am happy to have that for the rest of the year. We wake up, exercise, cook breakfast, watch the news, pack lunches, and start a load of laundery (prepped from the night before). My goals for the rest of the year – to start holiday shopping early and start saving with deals now! Put new tires on the mini van. Fix the ignition on the Neon. 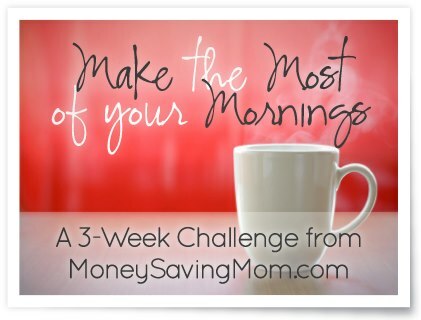 Reduce weekly grocery bill to $60 a week. Haha, keeping everyone accountable on their comments makes me feel SO much better about my shortcomings. I think I barely got to bed the same time as I did last night, which was an hour after my scheduled bedtime, and my wake up time was exactly the same, too, which was an hour and a half past my scheduled wake up. With my hubby outta town, I’m pretty sure I’ll be a little better since I’ve only got myself (and my son) to blame, but our “grown up” time will be non-existent since he’s gone. As far as goals, I’ll need to think it over. There’s so much going on lately that it’s difficult to really pinpoint anything specific before confirming if we’re buying a house or renting. I’ll do my best, though, and see you all back here Monday! I got to bed by 10, but woke up at 2:30 with back pain and didn’t sleep very well after that! So although my intention was to get up at 6, I reset my alarm for 6:30 because that extra 1/2 hour of sleep was more important than everything else at that point! I will be back to 6am wakeup tomorrow morning. I got up on time this morning, but I am still struggling with bedtime. My son was still awake at 1 a.m. because he had a friend sleep over and I had to stay up and wait on the tooth fairy to arrive. I have 3/5 of my must do’s tonight. I think once the kiddos go back to school on Monday everything will be easier. We have been letting them stay up a little later this summer which means that we have been getting to bed later. I am looking forward to sitting down this weekend and writing out my goals. 1. I am getting my before bed to-do’s done. I love going to bed and waking up with the kitchen in good order! I am not getting to bed on time because my sick toddler is keeping her awake, but I finally was able to take her to the doctor and get her some medicine, so I am sure that will improve soon. 2. I woke up on time today. WooHoo! I hardly got any sleep last night, but I woke up before my phone alarm went off anyway. I am sleeping in tomorrow, though. 3. longer range goal setting has always been hard for me. I have read yours, Crystal. I have read your posts on how to set them, and I have read other things about them, too. Still, I have a hard time defining my goals. I have a hard time defining things in terms other than nebulous phrases “grow in my relationship with the Lord” (what does that really mean and look like, anyway?) or “Be a good mom.” I look forward to reading Monday’s post. I am suprised at how well I have been doing with bedtime and 5 nightly things. I am equally surpised how hard it is to break the “Snooze button” habit. Oh well, tomorrow is another chance to get that habit started. Thanks so much for this challange. I’m so excited about goal setting! I really am enjoying this series and have actually been using it to help provide guidance for my 2 adult teens. Making tasks manageable is key to achieving them. I’ve noticed you’ve missed on 9:30 several times. At what point do you think you should reassess a goal and try to realize if it was set realistically and/or restructure that goal so it becomes a more reachable? I’ve been a little hit or miss on my 5 things. Mostly getting 3 out of 5 done. But the biggest improvement for me is actually going to bed on time and waking at 6am. Now yesterday I woke a little before 7am but my hubby and I were at a Bed and Breakfast for his birthday. We soo needed the relaxing time we had. But this morning i was up by 6am without an alarm. I have a really hard time with goal setting and breaking it down evern though I’ve read every post of Crystal’s on it. It feels really overwhelming but I’m going to try. 1. To lose the baby weight. 2. To learn to run a 5k. 3. Build up the portraiture side of my business. 4. Make time for my hobbies. Thanks for this post Crystal! I would like to write my goals in an organized way and am unsure how to do that. How do you log/keep track of your goals? I am not a computer spreadsheet person so I would have to write it in notebooks, any ideas on how to organize this? It seems a little overwhelming just getting started and if I don’t have a plan with organizing them then it just doesn’t get done…help! Thanks! Could you make a notebook with your goals for the year and then check them each week to make your weekly goal list? I just write mine up on the computer and then consult the list when I’m making my weekly goals and update my progress every month. It’s simple, but that seems to be enough to keep me on fairly good track. I really like this idea! Thank you! I have been doing pretty well with my 5 to-dos, getting to bed by 10 p.m. and waking up by 6 a.m. But, I think having a plan in place would definitely help me in the mornings. I have to sit down and come up with a routine i can do each morning – instead of just spinning my wheels (like I’m doing this morning)! Does anyone have early risers? If so how do you get stuff done in the morning. (exercise) my kids are up between 6-6:30. It varies everyday. I would have to get up at 5:30 and I just do not see that happening since one of them wake up to go potty or something each night. My husband goes to the gym at 5 in the morning, gets home after 6, then I head for my walk/jog/run while he takes care of the kids once they’re up. Great posting. A lot of other successful people argue for the need for a plan as well. One thing that I might add to the discussion is for your plan to be well thought out – in other words the goals you set should be mutually supportive, achievable and measurable. Thursday night I did great, but Friday night I think I slipped into “weekend mode”too early. I got to bed on time, but didn’t do my 5 before-bed things, and now (Saturday) instead of waking up ready to enjoy the weekend, I’ve woken up ready to enjoy the weekend *after* I get the house in order. Woops! Spreadsheets make me giddy– I’m a little bit of a nerd that way- so I’m already brainstorming ways to set up my daily to-do list with goals after Monday’s post. Thanks, Crystal! I give myself a break on the weekends. I was up at 10:30 today though which is my limit for waking up so I’m okay with that. Last night we got a new water heater so the water was shut off all evening. There was a lot that didn’t get done. I did read a book with my daughter and thawed food for dinner. I started some of this already, but it helps to put it down more clearly. It’s really nice, because my hubby and I are both introverts and like our “alone” time in the morning. I still need to look at the afternoon schedule, too. Now, I’m going to really look at what my goals are for the coming year. It’s my birthday month, so it’s a great time to start! Then I can review on my birthday next year. Yay! *Check To-Do list and calendar – Start with Top 3 for the day. However, the weekend is a good amount of time to brainstorm priorities and start setting goals. I’ve found it helpful to read other people’s goals (in the comments) and yours as well. I’m not done yet, but I am being active about setting priorities and goals. I’ve been doing good at getting to bed by 10pm (this is tremendous progress for me!!). I’m still struggling with falling asleep though–still awake at 11pm last night. The dog even slept in til 5:17 (he’s being re-crate trained), which is also tremendous progress! I did reset the alarm for an hour later (so I could get at least 7 hours sleep) & hit snooze several times. I’ve been getting the 5 To Do’s done, but think I need some wind down time to go to sleep. I may need to tweak my To Do’s. I’m wondering how to get everything done when I have evening meetings. So, my bedtime is going out the window, but I am in the last hour of canning 21 quarts of green beans. That is one yearly goal crossed off. I still have a couple months to finish crocheting the 8 yr blanket, but I have committed to 30 minutes a day and have stuck to it. This smaller goal thing really helps to put life in perspective. Thanks! Lost the rest of my baby weight (Why is it the last 15 pounds are the hardest to lose?!?!?!) This will include continuing following the Weight Watchers plan and exercising 3-5 times a week. Save for a weekend away for my husband and I, sans baby boy. Finish re-grouting the kitchen counters and paint the feature wall in the dining room. I missed this post on Friday. Let’s see…how did Thursday night go? I was in bed on time but spent some time talking to my husband (who was out of town for work all week). I did get up and not hit the snooze button (a major accomplishment for this chronic-snoozer). And, I did play some music first thing that morning to see if it would help me to have a better attitude. I think it did. I need to do it again! Five long-term goals…oh man, this is going to be the hard one for me. I work full-time outside the home, so as I think about making a list for the day, it mostly involves getting out the door and to work on-time and then managing to get dinner on the table in the evenings at a decent time. It feels like there’s not much time for extra stuff. Okay I have been doing great about getting my 5 things done each night (clean the kitchen, make lunches, pick up dining/living room, get coffee set for the next am, brush/floss teeth). I have actually even been getting into my bed. Since my divorce I developed a terrible habit of falling asleep (and waking up) on the couch. So even though I haven’t been sticking with my 11:30pm bed time I have been getting in bed each night and last night was the best I got in bed by 1am. I woke up to the alarm by 7am and was able to be ready before the kids wake up call. A total success! It definitely set the tone for my day. I am gonna actually work harder on putting myself in bed by 11:30. GoPeer: FREE Online Tutoring Session! Expo Low Odor Dry Erase Markers (36 count) only $16.06! KitchenAid 3-Speed Hand Blender only $34.99 shipped! Get 15 Days to a Healthier You for just $7.50!